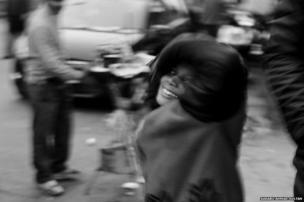 Aarabu Ahmad Sultan's images of child beggars in the Indian capital, Delhi. 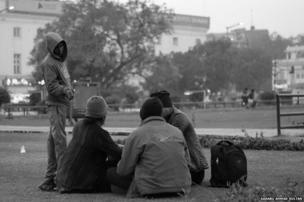 There are some 60,000 beggars on the streets of the Indian capital, Delhi. A third of them are under 18 years of age. 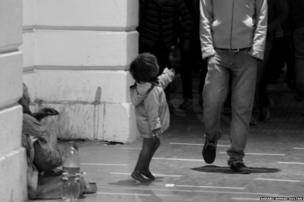 Children escaping poverty from other parts of the country come to Delhi and end up begging. 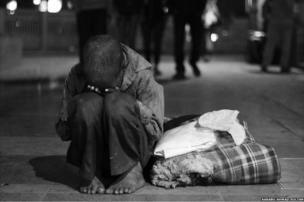 Some of them run away from their homes; others live with their families and beg. Children in India have the right to food and education, but begging remains rampant. Child beggars are mainly found in busy market places, at traffic lights, railway stations, bus stops, outside metro stations, subways, religious places and tourist destinations. Begging in busy areas offers them a chance to make more money. Many poor families feel they have no choice but to make their children beg to earn a living. 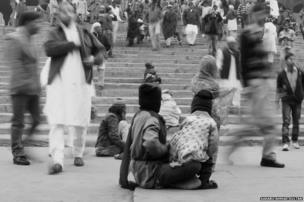 Children such as these can be seen begging alongside their parents, like these child beggars who wait outside the Jama Masjid (mosque) in old Delhi. Sonu lives with his mother in a Sikh temple and seeks alms and food from commuters in the neighbourhood. He earns around 50 rupees (83 cents; 48 pence) a day. He says he does not know the whereabouts of his father. Police and activists say thousands of children are also abducted from their homes across the country and forced to beg on the streets of big cities by suspected traffickers. 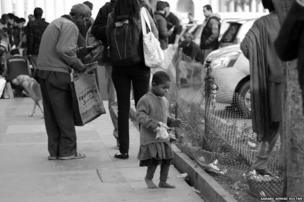 Here, a young girl begs in the busy business district of Connaught Place. Child rights campaigners say the children are often forced to work for begging mafias, they are often starved to make them look thin and weak to generate sympathy from people. Campaigners say begging mafias often maim the children as disabled beggars get more money than healthy ones. Many of these children end up taking drugs and becoming victims of sexual abuse, according to activists. 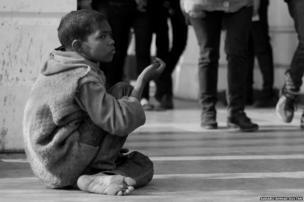 There are no federal laws to protect India's child beggars or to help them improve their lives. Begging is illegal in several Indian cities, including Delhi, under a 55-year-old law which gives police the power to arrest anyone found begging on the streets. Campaigners say the law is often used by the police to discriminate against the poor, especially child beggars.